Arizona's San Pedro River - the Southwest's last natural low-desert river - still faces a number of threats to its survival. 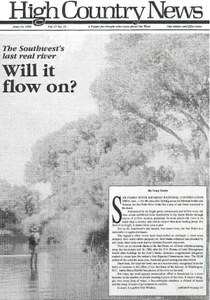 The Southwest's last real river: Will it flow on? Arizona naturalist Sandy Anderson tries to educate people about the wildlife of the San Pedro. Sierra Vista City Councilman Harold Vangilder defends human use of the San Pedro River. Conservationists protect the U.S. Fish and Wildlife Service's decision and deny the Canada lynx a place on the list of endangered species. The writer muses about loving and protecting the landscape of one's own backyard. The nonprofit Colorado Rivers Alliance aims to protect and restore Colorado rivers. A conference is planned called "How Do You Achieve Affordable Housing in a Growth Managed Community? A strategic Working Session." A new nonprofit called Leave No Trace Inc. wants to educate backcountry users about minimum-impact recreation. This year's fishtrap gathering is called "Orphaned in Eden: The Search for Family in the West." The first annual Sun Sprint of the Rockies Solar and Electric car race will run from Aspen, Colo., to Moab, Utah. An article by Patrick Jobes in "Western Planner" offers a profoundly pessimistic view of the West's growing amenity towns. "Cow cops" in Oregon, "White Knight" claims land in Idaho's Nez Perce National Forest, Forest Service employees worry about bombs, timber industry has trouble buying salvage sales it pushed for. It must be spring, odds and ends. Hopes that a giant spring runoff would help baby Snake River salmon get past dams to the Pacific are killed by the weather and the Army Corps of Engineers. The federal government finally pays Washington's Colville Confederated Tribes to compensate for land taken to build Grand Coulee Dam 62 years ago. Can land trades stop a subdivision and clean up a mine? An ambitious land-swapping plan may help reclaim some of Mid-Continent Resources defunct mines while also protecting them from development. Republican County Commissioner Adam Dahlman discovers that for every dollar Teton County taxpayers pay, $2.50 comes back from the federal government. Forest Service biologist John Weaver learns from a lynx named Chirp that he raised from a kitten. The Livestock Grazing Act of 1995, introduced by New Mexico Republican Sen. Pete Dominici, would kill Bruce Babbitt's grazing reform efforts. Who needs ski resorts anyway?